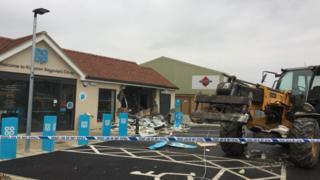 Thieves have used a digger to steal a cash machine from a convenience store in an Oxfordshire village. Thames Valley Police received a call at 02:13 GMT to the Co-op store in Witney Road, Kingston Bagpuize. The ATM and an unknown quantity of cash were stolen, police have not yet made any arrests. It is one of a series of ram raids in and around the county, but is not currently being linked to any other offences, Thames Valley Police said. Det Sgt Aidan Donohoe said the force was "keeping an open mind as to whether are links with any recent similar offences across Oxfordshire". One resident told the BBC local people were shocked when they saw the damage. "People who lived a few streets away said they could smell brick dust in the night," she added.